I make my final car payment this month, just in time to watch my vehicle’s manufacturer spin out of orbit. I’ve read a couple articles about what’s happening to Saturn, and I still don’t understand what’s going on. From what I have been able to decipher, GM will continue to make and sell Saturns until 2011, since that is how far in advance they have planned. After that… they will either sell the brand to someone else or use the network of dealerships to sell lots of different brands of cars under one roof? I think? Maybe? Yes? No? It’s all rather sad, because I love my Saturn. Yes, it only has 4 cylinders. Yes, it barely made it up the Appalachian mountains. But it is fuel efficient and shiny and the back seats fold down and I have a CD player and a cassette deck (for my MP3 player’s car kit) and it carts me around town, which is all I really need. It gets the job done and it only cost about $8,000 and I paid for it all with my own money, so it is mine, mine, mine! Plus, it is a small car I would not have been able to fit into 4 years ago, so I’m proud that there is space between me and the wheel. That’s why it was rather depressing to read this post on a car blog called Jalopnik about how much they thought Saturn sucked. Then Dana Danger told me that blog is targeted at the demographic crossover between video-gamers and car freaks, so they are mostly little boys who are mad they have to drive their moms’ Saturns. Then I felt better. The odd thing is my last car was an Oldsmobile…which also went out of business. I buy classic cars before they become classics. Watch out dealerships! In another few years I’ll probably be buying a new car. Pray I don’t come to your lot. Later: The falcons are back! PS, I’m 5’1″ so when I mean small I mean SMALL. Wow, we have the same exact car, down to the color! I had not heard about Saturn’s plans and they make me a little sad. A Saturn was always good for young people buying their first car – for a while 4 of my college friends all had Saturns. It always amazes me to see hybrids that have a worse MPG rating than my SL2. I know they changed the MPG calculations recently, but my 10 year old car gets 35 MPG on the highway and some sedan hybrids are rated at only like 27 or 30? Ridiculous! Yes, my beloved Pontiac brand is on the chopping block too. There is just so much capital in that name that I am so sad it is just going to fade into oblivion — so long Knight Rider, so long Bandit, you guys will have to get Toyotas…. I sort of feel bad for buying a foreign car (Hyundai) but like you I am paying for it myself and it was cheap(er). Do us all a solid and buy a Hummer next, won’t you? I’d love to see them go out of business, at least for the sake of the enviroment. I fully and proudly own a ’99 Saturn. I love my Saturn. However, it is sadly falling apart. I am so used to not having a car payment. I was going to get another one. I just love the whole philosophy. Why can’t they get rid of the Dodge Neon? I, too, was sad to hear about GM’s plans for Saturn. I’ve only ever driven Saturns – I’m on my third – and I love them. My ION is only 3 years old, but I was already plotting to get an Astra when I needed a new car. Now what will I do? The first car I bought and paid for myself was a plum-colored 1994 SL2. I loved that thing, and when I finally had to give it up, it had about 170,000 miles on it. And all of my Saturns have gotten 30+ miles to the gallon. What’s not to love? Our first “new” car was a Saturn 1994, great car! We still have it debating on saving it for my teenager. We wore out the the seat and it as just starting to have a few problems around 209K miles! I bought a 1992 Saturn SL2 brand new and drove the ever-living-life out of that thing. It took me from Texas to Alaska and back twice, and across the middle US more times than I can remember. When I traded it in on my Subaru, it had over 250k miles on it. Of course it required nearly a quart of oil a day at that point and when it got up over 60 you’d think it had some kind of palsy, but it was a great car. I was sad to hear that they were eliminating the line. I can only hope my Subaru will last as long and treat me as well. I had two Saturns. The first one, a 93, was a great car. But apparently they changed the way they made the engines, and the 95 that I bought (after the 93 was totalled in an accident), was a terrible car and started burning a quart of oil a week at about 100,000 miles. Apparently this was not an unusual problem in that particular car, but Saturn refused to acknowledge it. I also had problems at my particular dealership with a really patronizing, rude, service associate. I quit taking my car to the dealership after he told me it was normal for the coolant temp indicator to go all the way into the red when I was stuck in traffic. I took it to a Precision Tune and they discovered that the motor for the fan had burned out. So now I drive a Honda, and love it. I seriously love my Honda Civic. It’s a 2003, black, four-door with damn near 100k miles on it. It has so many good memories attached to it, I’m going to hold onto it for as long as I can. Please do not visit me at work. But feel free to go visit our arch enemies down the street, ‘k? I love my ’99 Saturn SL1 — for all the reasons you mentioned. It’s a great little camping car, because the back seats fold down for lots of cargo room. Mine is a 4 cylinder, 5-speed, and while it is not powerful, it is peppy enough to successfully launch me onto the Chicago expressways. I am very sad about the demise of Saturn. No more carnations on the dashboard! they used to have those little “sending off” parties too for you when you drove it off the lot..made me feel so special..did you have that too? I had no idea Saturn was going out of business. This economy really is depressing. I have a Saturn that looks almost exactly like yours, except it’s a ’97. I didn’t know this news (see what you can learn in the blogosphere? ), and it makes me sad, too. I don’t have the same pride of ownership, though, as this WAS my mother’s car. I can hardly believe she bought it since I have trouble getting in & out, and she was 3-4 inches taller than I! It was probably the no-hassle deal. My boyfriend is a hybrid of video gamer and car geek. My boyfriend used to drive his mother’s Saturn. Hey, PQ. I know this may be too personal/what-have-you, and, if so, feel free to ignore it, but! I was just reading your latest tweet and wondered what med they’re trying for you now? I’m a pharmacy tech, so I’m just curious. my partner and i LOVE our saturns!!!! they have required very little maintenance. mechanics are always amazed at the amount of miles on them when they service them for the first time for, say, a clutch, brakes… we have traveled all over the country in our saturns and since they are a ’92 and a ’96 (bought new) we haven’t had a car payment in years!!!! are you a lefty? i see you wear your watch on your right hand. @Pam – No, I’m just a weird righty. Wow, that other blog assessment of the brand could not be any more wrong. 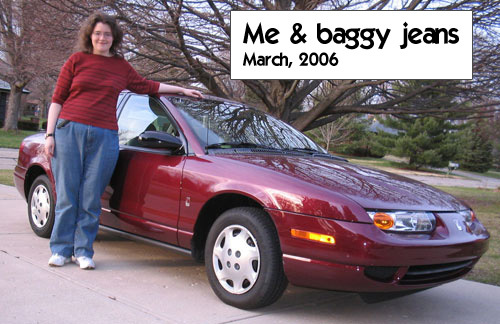 I have known 3 Saturn owners, and their experience was great… so much so that they had enough brand loyalty to go and pick up their SUV model when it came out. I have heard nothing but good experiences with their vehicles… sure they might be underpowered but they serve their purpose as advertised. I believe the brand was innovative and not sure why it was not profitable because from at least the consumer side it seemed to be doing quite a great job. I had a an Sl2 and had a horrible time with it. Stuff was constantly breaking. It was an awful car. And the dealership was not helpful at all. Your posts make me think maybe I was just unlucky. I loved my Saturns – yes both of them! I even worked in the service department of my local dealer for about 6 months. I am so sad about that business failing thing. My first one was my very first new car and I felt so special about driving it. I even drove it across the country and back on a 3 week solo road trip – and mine DID in fact make it over the Rockies – in a snow storm none the less! When they first came out, it was awesome! Still one of the best used cars to buy too in my opinion. Hmmm, well, I never bought a Saturn, but I thought about it once. I will put the car companies out of business for a different reason. I pick cars that I know I will love and I keep ’em until they drop dead, LOL! My first car, a ’85 Toyota Camry hatchback lasted 17 years and 198,000 miles. Regularly got 35-38 mpg highway. Now I have a 2002 Subaru Outback which I expect might last me even longer. Car salesmen hate me.